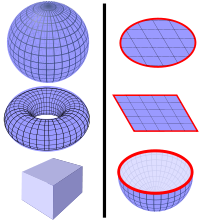 In topology, a surface is a two-dimensional manifold. 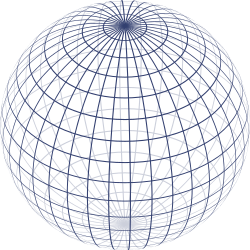 Some surfaces arise as the boundaries of three-dimensional solids; for example, the sphere is the boundary of the solid ball. Other surfaces arise as graphs of functions of two variables; see the figure at right. However, surfaces can also be defined abstractly, without reference to any ambient space. For example, the Klein bottle is a surface that cannot be embedded in three-dimensional Euclidean space. Topological surfaces are sometimes equipped with additional information, such as a Riemannian metric or a complex structure, that connects them to other disciplines within mathematics, such as differential geometry and complex analysis. The various mathematical notions of surface can be used to model surfaces in the physical world. 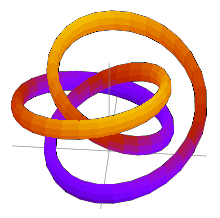 In differential and algebraic geometry, extra structure is added upon the topology of the surface. This added structures can be a smoothness structure (making it possible to define differentiable maps to and from the surface), a Riemannian metric (making it possible to define length and angles on the surface), a complex structure (making it possible to define holomorphic maps to and from the surface—in which case the surface is called a Riemann surface), or an algebraic structure (making it possible to detect singularities, such as self-intersections and cusps, that cannot be described solely in terms of the underlying topology). that contains its boundary is a surface that is topologically closed, but not a closed surface. for example in the study of the mapping class group. A Riemann surface is a complex 1-manifold. On a purely topological level, a Riemann surface is therefore also an orientable surface in the sense of this article. In fact, every compact orientable surface is realizable as a Riemann surface. Thus compact Riemann surfaces are characterized topologically by their genus: 0, 1, 2, .... On the other hand, the genus does not characterize the complex structure. For example, there are uncountably many non-isomorphic compact Riemann surfaces of genus 1 (the elliptic curves).